Google reminded me this morning 23 April that it is St George's day, patron saint of England. Shakespeare was also born on 23 April, in 1564 and he died on the same day in 1616. St George is always depicted as a warrior knight of a saint, slaying a dragon whilst variously rescuing a maiden into the bargain. His emblem, a red cross on a white background, came to be adopted in the 12th century by England’s medieval king Richard I also known as Richard The Lion Heart. England’s medieval knights wore the cross on their tunics over chain mail to avoid confusion in battle. 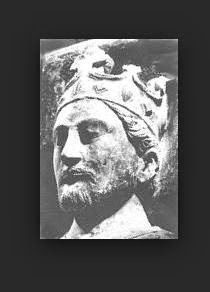 Richard, a French speaking king of England, was so fond of picking quarrels and fighting wars that he spent precious few months of his life ruling in the country. In fact Richard left sheriffs, his mother and his brother John to do that, and therein lies folklore surrounding a certain “Robin Hood”. And, reknowned warrior knight that he was, he did spend a considerable period captured and held to ransom! A bit of a disaster for England if the truth be known. England came to adopt St George sometime later when he replaced St Edmund the Martyr as England’s patron saint in the 14th century. 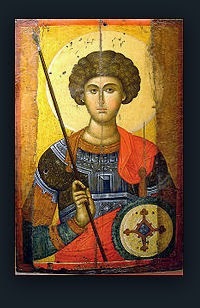 St George is patron saint of many other regions and countries including Aragon, Catalonia, England, Ethiopia, Georgia, Greece, Lithuania, Palestine, Portugal, and Russia and of many cities. He is also patron saint of scouts, soldiers, archers, cavalry and chivalry, farmers and field workers, riders and saddlers, and he helps those suffering from leprosy, plague and syphilis. So that was quite handy in medieval times! Those medieval knights and nobles returning from far off lands did English cookery a big favour though.They brought back, and arranged trade in, many spices and new fruits and vegetables from the Near and Middle East, some with origins much further afield in China and India. The much loved tradition of adding sweet and warming spices to minced meat pies took off. And MedievalMorsels models’ listing notes reflect this. MedievalMorsels is now on FaceBook! Please visit and @like@ if you can! Easter is here! Heralding Spring at last.